Everything you need for the tour will be taken care of inter-island plane tickets, chauffeured quality transfers from Honolulu Airport to Pearl Harbor where you will be met by our supervisor who will be meeting with you and orient you and provide you with your vouchers and tickets. Take note that this is a very small group tour, and you are not required to stay with group. 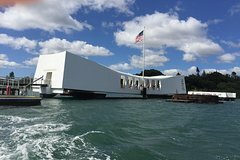 You don’t have to wait in line behind thousands for USS Arizona Memorial ticket; no following tour guides and big groups as well. Basically, there’s really nothing more for you to do but to just hop aboard the plane, relax, and look forward to an exciting day on Oahu and visit to USS Arizona Memorial. As part of this package you will visit pearl harbor first then you go tour around Oahu north shore next. Then you will leave Pearl Harbor and visit the most wanted major attractions along the North shore of Oahu. Free complimentary soft tropical drink or bottled water Bottled water included or tropical juice will be offer to you. • Dole PlantationHave lunch at Pearl Harbor (American Hot--Dog and Soup or a plate of nachos). Beautiful sitting ocean front next to USS Bowfin Submarine.